On July 13, 2017, the Taste of Immokalee team gathered together and jumped onto a Naples Transportation bus with another group to the Naples Botanical Garden. 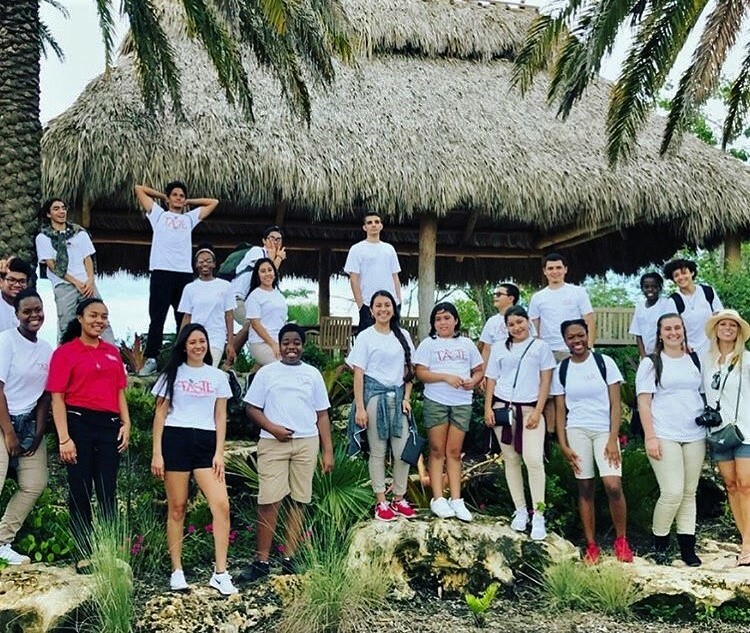 This group was called Cultivate Immokalee, and their mission, according to the 1 By 1 Leadership, is to â€œencourage school children and their families to use simple technologies such as Earth Boxes. Educate community groups on how to grow, share, and sell vegetables and fruits.â€ The team joined up with Cultivate Immokalee to explore ideas for our Earth Boxes. These Earth Boxes are going to help people in Immokalee have a way to get fresh produce without a lot of land space. The Naples Botanical Garden sprawls over 170 acres with over 1000 different species of plants. It has a special emphasis on the species of plants between the 26th parallel north and the 26th parallel south around the equator. This garden is home to many species and it is a unique site to see plants from across the globe right next to each other. The trip to the botanical gardens was nothing short of amazing. The team walked around the various types of gardens that the Naples Botanical Garden encloses. The garden takes plants from all over the equator to make the various gardens. For example, the gardens are as follows: Asian, Brazilian, Caribbean, Florida, Childrenâ€™s, Water, and Preserve. There is also a garden called the â€œEnabling Garden.â€ This gardenâ€™s purpose is to give opportunities to the disabled people of the community. The Enabling Garden had different sensory-enabling plants. For example, there was a plant that smelled like popcorn when the leaves were rubbed. Ian Almodovar rubbed the plant and was surprised when the familiar scent of buttered popcorn flooded his nose. There was also a plant that smelled like the lemon pledge detergent. There were also plants that were for the eyes. They were beautiful and calming. The garden also had chimes that helped with the hearing sense. In the beginning of the garden, there were low chimes sounding and on the opposing end of the garden there were higher-pitched chimes. The Naples Botanical Garden has classes that teach people of the community gardening skills. Our tour guide told us that these small adjustments made it easier for the disabled people of the community to enjoy the garden and learn important life skills. The team really enjoyed the Naples Botanical Garden and the hope it brings to the community. Taste of Immokalee and Cultivate Immokalee were so happy to be in this amazing garden to learn more about our Earth Boxes. 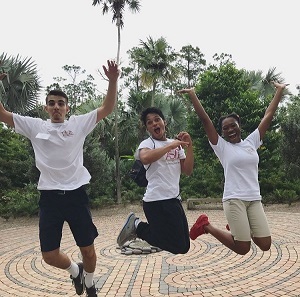 Omid Ghazizadeh, Ian Almodovar, and Azariah Howard visit the labyrinth by the garden. This labyrinth is supposed to help with calming and peace. They all jumped for a photo and made amazing faces. As the team continued exploring the gardens, they came across the butterfly garden. The butterfly garden was filled with so many different flowers for the various types of butterflies. Next to the butterfly garden was a small playground that the kids enjoyed. The kids climbed up the narrow space while struggling with their long legs. The team ended their tour on the top of a beautiful waterfall. It fell into a pond against the mowed, tidy lawn. They thanked our amazing tour guides and gathered at the top to look out across the garden. It was beautiful.